Joseph Smith (1805-1844) wrote of Zion even before the organization of the Latter Day Saint church. In April 1829, he dictated a revelation which urged him and his scribe, Oliver Cowdery (1806-1850), to "seek to bring forth and establish the cause of Zion." The attempt to reach that goal became a driving force in early Latter Day Saint history, and remains a powerful influence among Latter Day Saints today. In its broadest sense, Zion is regarded by Latter Day Saints as an association of the "pure in heart." Central to Zion's philosophical underpinnings was a sense of community cohesiveness and unity, a concept which seemed to be unraveling in the world of Jacksonian Democracy. Smith taught that the people of Zion would have all things in common, and would not allow others in their community to suffer because of the principles of love, unselfishness, and work for the common good which would be imbued in the individuals capable of maintaining such a society. Zion therefore stands in contrast to proverbial Babylon, where wickedness, disunity, and poverty prevail. Soon after the founding of the Latter Day Saint church in April 1830, Smith designated a physical location for the Saints to start to build Zion, which he taught would be the future New Jerusalem. 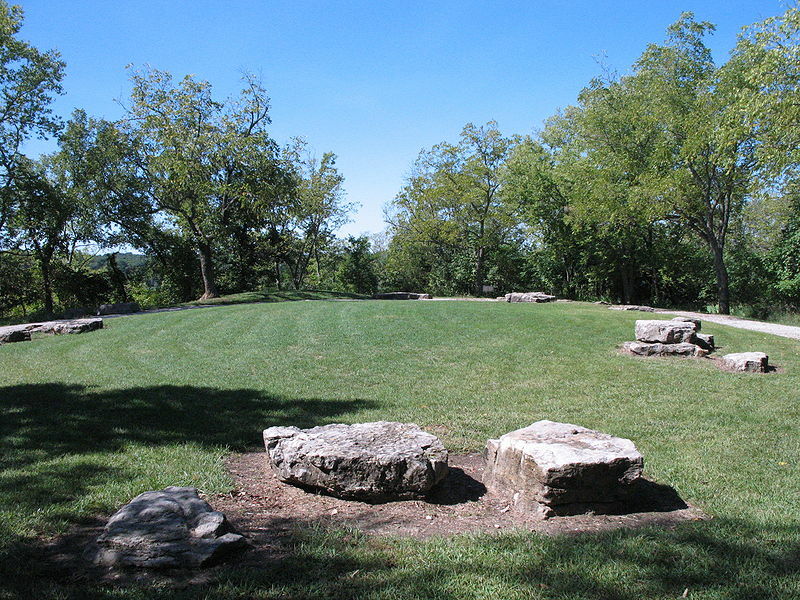 On July 20, 1831, Smith stated that he had received a revelation that designated Missouri as the "land which I have appointed and consecrated for the gathering of the saints." The revelation further stated, "Behold, the place which is now called Independence is the center place; and the spot for the temple is lying westward..." Smith later envisioned the temple as being the starting point for the creation of a New Jerusalem: "Verily this is the word of the Lord, that the city New Jerusalem shall be built by the gathering of the saints, beginning at this place, even the place of the temple, which temple shall be reared in this generation." The state of Missouri was organized as a slave state from the major federal legislation passed in 1830 known as the Missouri Compromise. Many of the settlers there were active pro-slavers who would progressively become very hostile to those arrivals from New England who shared abolitionist views. This hostility was first manifest towards the Mormons in the 1830s and then in the Missouri-Kansas wars of the 1850s which then became a trigger point for the US Civil War (1861-1865). The first Latter-day Saints to arrive in Missouri were four missionaries of the church on a mission to preach the gospel to the indian tribes to the west. Unsuccessful there, they stopped for a time in Independence, Missouri and preached to the settlers already there and in many surrounding communities. Section 28 and https://www.lds.org/scriptures/dc-testament/dc/30 30], given in September 1830, gives instructions to these missionaries. They left soon after the church general conference of Sept 26, 1830, arriving in Missouri later the next month. Oliver Cowdery (1806-1850) - mission leader, had only just previously helped the prophet Joseph Smith (1805-1844) with the translation of the Book of Mormon and organizing the church, becoming its second elder. Parley Parker Pratt (1807-1857) - early convert who later became one of the original members of the quorum of twelve apostles. Peter Whitmer (1809-1836) - one of the Eight witnesses to the authenticity of the Book of Mormon. Richard Ziba Peterson (1805-1849) - "Ziba" married a girl he met in Independence and stayed to settle there. A comprehensive city plat was devised by Smith in 1833, describing the planned city as an organized grid system of blocks and streets, a type of city plan that saw widespread use in Western United States communities. Designed around Latter Day Saint principles of agrarianism order and community, the plan called for 24 temples at the city's center, reflecting the central role played by the church in the community. The temples were to be used for education, administration, cultural events and worship. The plan called for a city of 15,000 to 20,000 people living in a one‑mile square city with agricultural land to be reserved on all sides of the city, enough to supply the city "without going too great of a distance". The plan did not allow a city to become too large; once a city had reached the 20,000 limit it was envisaged that other cities would be built: "When this square is thus laid off and supplied, lay off another in the same way, and so fill up the world." While never utilized, the plat ultimately served as a blueprint for subsequent Mormon settlements in the Utah. Zion is the name of a physical city founded by the prophet , also known as the City of Enoch. Zion is also, according to Joseph Smith (1805-1844), the entirety of the Americas. Joseph Smith stated that "the whole of America is Zion itself from north to south". Zion is a metaphor for a unified society of Latter Day Saints, metaphorically gathered as members of The Church of Jesus Christ of Latter-day Saints. In this sense any stake of the church may be referred to as a "stake of Zion." Sidney Gilbert Family - cousins to the Rollins Family (below) who were also living in their home at this time. Algernon Sidney Gilbert (1789-1834) - Operator the village store, an bishop's agent for the church in Missouri. Store was destroyed by the mobs and Sidney died from the cholera that afflicted Zions Camp. Elizabeth Van Benthusen (1800-1891) - wife, no living children. Richard Ziba Peterson (1805-1849) - "Ziba" was one of the four missionaries that came west in late 1830 to preach to the Native Americans near here. He married a girl who family was one of the early converts from nearby Lafayette County, Missouri and stayed to settle here. Together they had 8 children. Stayed behind and left Mormonism when the mobs drove the settlers out of Jackson County. He eventually went to the gold rush in 1849 California where he became a hanging sheriff and then he died. Rebecca Hopper (1808-1896) - followed husband to California during the Gold Rush. Emily C Peterson (1832-1897) - first child of family. Keziah Keturah van Benthuysen (1795-1877) - after her first husband, Mr Rollins, died in a shipwreck, Keziah and her three small children moved in with her sister and brother-in-law, Algernon Sidney Gilbert (1789-1834). James Henry Rollins (1816-1899) - helped bury the cholera victims from Zion's Camp (1834). Mary Elizabeth Rollins (1818-1913) - teenage Mary and her sister Caroline, were famous for their efforts to save the manuscript pages of The Book of Commandements when the mobs destroyed the printing press. Later a plural wife of first Joseph Smith (1805-1844) and then Brigham Young (1801-1877). In Sept 1831, the four missionaries baptized several families remained living in Lafayette County, Missouri (immediately to the east of Jackson Co, probably in Wellington, Missouri. John Killian (1796-1858) - After Lydia's death he married her cousin, Sarah McClure and they settled first in Caldwell County, Missouri where he was the captain of the militia, then Nauvoo and eventually in Utah. ^ Taysom, Stephen C. (2010). "Imagination and Reality in the Mormon Zion". Shakers, Mormons, and Religious Worlds: Conflicting Visions, Contested Boundaries. Religion in North America. Bloomington, Indiana: Indiana University Press. p. 61. ISBN 978-0-253-35540-9. https://books.google.com/books?id=0a4tbtxBOssC&pg=PA61. The Eternal Perspective of Zions Camp by James L Bradley - (Pulb 2004). Zion's Camp 1834: Prelude to the Civil War by James L Bradley - (Pulb 1990). Daniels, Brigham (2008). "Revitalizing Zion: Nineteenth-Century Mormonism and Today's Urban Sprawl". Journal of Land, Resources and Environmental Law 28 (2): 257–300. Olsen, Stephen L. (1993). "Joseph Smith's Concept of the City of Zion". In Black, Susan Easton; Tate, Charles D., Jr.. Joseph Smith: The Prophet, The Man. Provo, UT: Religious Studies Center, Brigham Young University. pp. 203–211. ISBN 0-88494-876-5. OCLC 28591942. http://rsc.byu.edu/archived/joseph-smith-prophet-man/15-joseph-smith%E2%80%99s-concept-city-zion.